Yesterday I had to recut the front bands for my BWOF blouse. I lengthened the bodice pattern pieces but I forgot to lengthen the front band pattern pieces. Ugh. Just one more thing to further slow down my snail-like sewing pace. Good thing I had plenty of fabric leftover. Actually, the reason I haven't been doing much sewing this week is Lost Cities. Last weekend, my husband and I popped into a new game store that just opened up in our 'hood, Blue Highway Games. 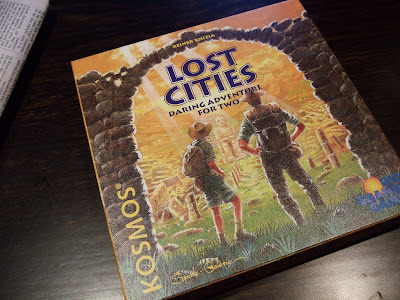 I had heard that Lost Cities was a good two-person game, so we purchased it. And now we are hooked. The strategies are quick to learn, and even when you lose you always feel as if you could make a comeback in the next round. Anyway, I think I am going to decline all social invitations for Friday evening to stay home and finish up that blouse! I get distracted by games sometimes too! It sounds like fun. Good luck working on the blouse today! I should do the same thing, stay home and hem a blouse I am making! I really like this game too! My beau and I can always kill a couple of hours at our local McMenamin's pub drinking beer and playing Lost Cities. But don't let it take too much time away from your crafting, which I enjoy seeing too.